I used to say, before I met Hugh, that I needed to find myself a man who either loved to cook, or who was rich enough that we could hire a personal chef. Luckily, Hugh fits the former description. He makes me the tastiest meals for dinner! The other night, he was craving a Big Mac, but we're on a diet (it's a no KFC or McDonald's diet). So he decided to make a Big Mac pizza. 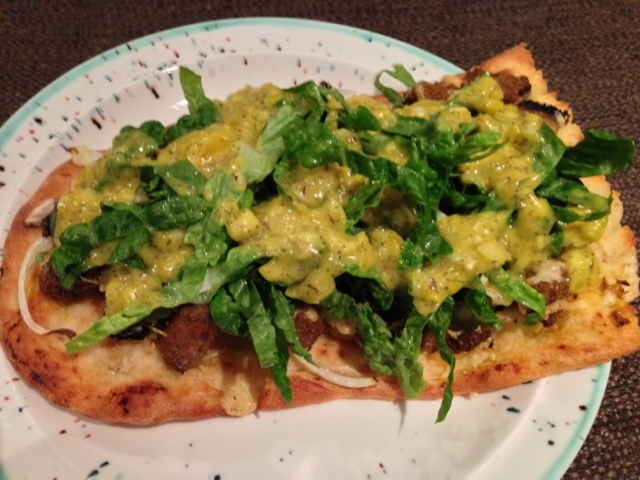 He used a focaccia bread base, then added sausage bits, onions, pickles, and lettuce. He googled a recipe for special sauce. It didn't quite taste like a Big Mac, but it was really tasty! No complaints from this McDonald's baby! A few nights later, he decided to tackle Kentucky Fried Chicken. My mouth is watering just remembering the result! 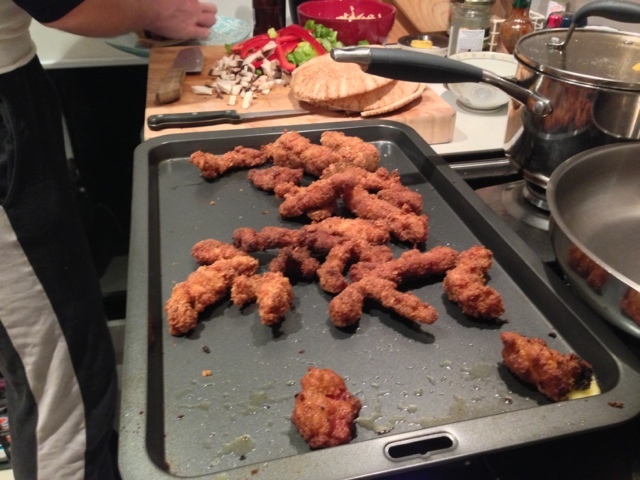 He used little chicken strips, panko breadcrumbs, and a beer batter mix. When he had battered all the chicken, he had a bit of batter left over, so he battered a couple chunks of cheese and some slices of chorizo. Soooo yummy!! The chicken was super tender and juicy, and we ate it in pitas with lots of veggies. There might be a reason, though, why I haven't lost any weight on this "diet."